Mrs Lightfoot welcomed everyone into worship today and praised everyone for their beautiful entry into the hall for our special time. She lit the candle and Noah said the important words of 'The Lord is Here'. God loves me whoopah, wahay! 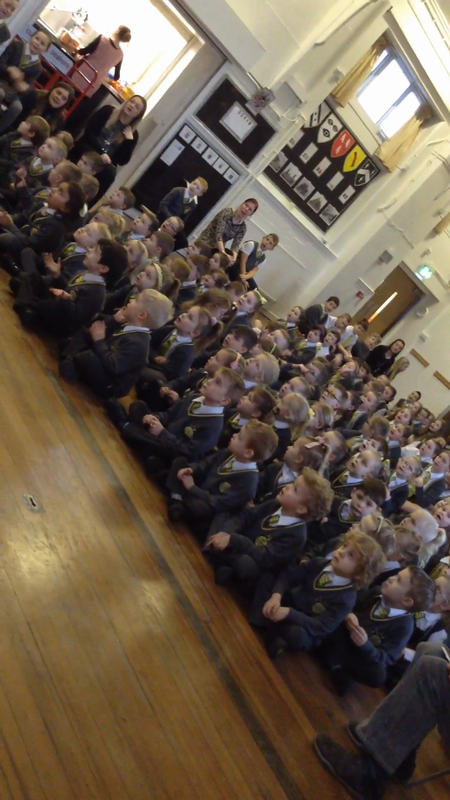 Father Kevin brought a bag of maltesers today, which definitely intrigued the children. The children became rather excited when Father Kevin opened the bag and asked who likes maltesers? Some of the children were treated to a little gift and it was lovely to hear them using their St John’s manners to say thank you for the wonderful treat. Father Kevin reminded the children that we are often gifted with things, but we are used to having the gift that we forget to say thank you - some examples are having our clothes washed and our dinner being made. Today, we focused on the time when Jesus was only 40 days old (Luke 2: 22 - 40). He was taken to the temple in Jerusalem. Mary and Joseph took Jesus to the temple to say thank you for giving them such a wonderful gift - Jesus' life. They thought this would be a peaceful and quiet experience - a personal celebration. However, their experience was not as quiet as they had hoped. When they got to the temple, there were two other people there. These people were Simeon and Anna. They had been told that they would see God's Son and he would be brought to the temple. They weren't told when this would happen, but whilst praying to God, they were told it would happen. Simeon and Anna were very patient people and had been waiting for a very long time for God's Son to arrive. As Mary and Joseph entered, Simeon knew straight away that the baby was in fact God's Son. Mary and Joseph were amazed and surprised as Simeon immediately started praying. Anna was so excited that she started to tell everyone in the temple who the baby was. She told them that Jesus was going to save us all. she said thank you to God for this wonderful gift. Everyone rejoiced and wanted to see the baby - God's Son. Father Kevin reminded us that Jesus was our gift from God. We should be grateful for his wonderful gift that enabled us to have a fantastic life. Father Kevin then finished our worship time with a prayer. We thank you Father God for this new day and the wonderful experiences we have. We thank you for every new day, for each other and for everyone that we will share our day with. We hope that you will help us to be grateful and thankful for all of the wonderful gifts that we receive each day! Melissa ended our worship time by reading her poem to the rest of the children. She had listened to the key messages about their only being one you, following the words of Micah and to always be kind. Melissa was awarded with a special award - the award of love.